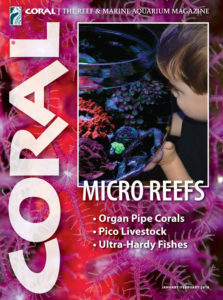 Launching the 15th year of CORAL Magazine, our home-grown MICRO REEFS feature issue investigates keeping the smallest of reef aquaria (those under 3 gallons). 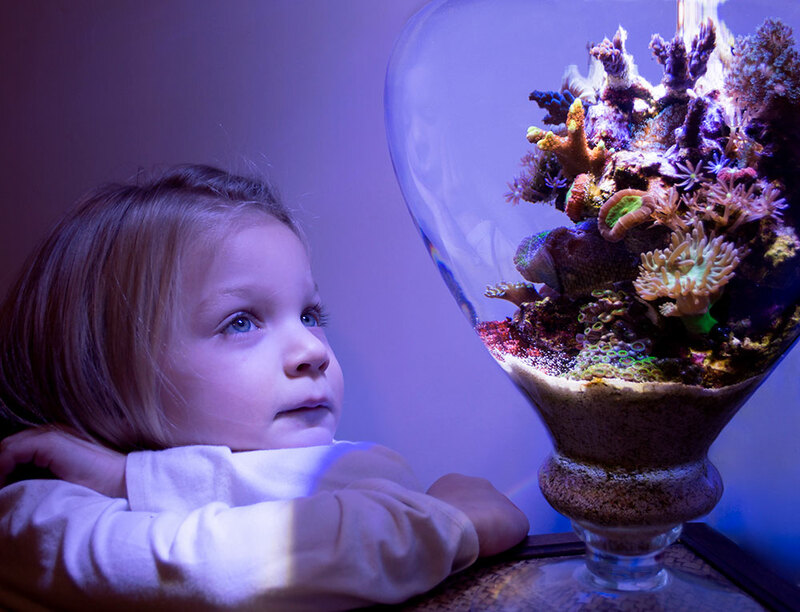 Expert contributors offer their secrets behind a proven track record of keeping reef aquariums in the tiniest of tanks, some for years. Whether they’re “reef bowls,” “vase reefs,” or “reefs in a jar,” the emphasis on simplicity and routine yields predictable, consistent results with these incomprehensibly small saltwater aquariums. While a pico reef is potentially inexpensive to start, reef tanks require stability, and stability is often found through volume. Small water bodies can become polluted extremely quickly. Water parameters such as salinity, temperature or pH, can go off the rails in a catastrophic manner, possibly in a matter of hours or minutes. We’ll definitely caution the first-time aquarist who views these as perhaps an ideal starting point. Indeed, in our issue, one contributor envisions giving away frags and a minimal setup as an ideal way to evangelize your reef aquarium hobby to friends and family, however preferably this is done with your support, guidance, and frags from your own tank! We can easily envision scenarios relating to water changes being one of the largest hurdles for beginners who lack the basic skill of properly mixing and storing water, as well as matching parameters prior to a change. Seasoned reef hobbyists who already have larger mixing reservoirs won’t have these issues, sparing a couple gallons per week for their micro-reef is an afterthought, and they’ll likely see easy success with any pico reef they establish. Our advice for new hobbyists might be to avoid this altogether by using one of the pre-bottled natural “live” saltwater products available or to support your local fish shop who sells pre-mixed, reef-specific saltwater at the appropriate salt levels. If you’re ready to cram the entirety of a living coral reef into the equivalent of a cookie jar, we invite you to read/purchase/download/digital archive CORAL Magazine’s MICRO REEFS issue, Volume 15, Issue 1. Then, browse these online resources for more information, for inspiration, and to locate communities of like-minded aquarists. 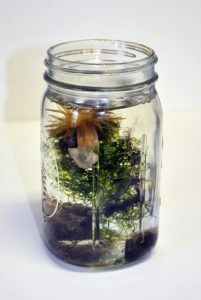 Could Pratt’s Aiptasia Jars become the gateway leading to many new reef aquarists? A Definitive (and Free) Guide to Eviota Goby Species – This identification key covers over 100 species of Eviota, all ideal candidates for the keeper of a micro reef that simply must have a fish or two. Aquarium Sizes – Bob Fenner discusses the pitfalls of reef aquariums under 40 gallons, and the article concludes with several aquarium volume references and conversion tools. Building a Vase Reef, Part 1 – Keeping a reef aquarium that might hold only a gallon of water might sound dangerous, risky, or downright irresponsible. So before our MICRO REEFS issue went to press, Sr. Editor Matt Pedersen applied our contributor’s methodologies in a proof of concept reef. Nano-Reef.com has been the defacto small-to-micro reef tank community for well over a decade.